This January, Google and SyScan announced a secure coding competition open to students from all over the world. While Google’s Summer of Code and Code-in encourage students to contribute to open source projects, Hardcode was a call for students who wanted to showcase their skills both in software development and security. Given the scope of today’s online threats, we think it’s incredibly important to practice secure coding habits early on. Hundreds of students from 25 countries and across five continents signed up to receive updates and information about the competition, and over 100 teams participated. During the preliminary online round, teams built applications on Google App Engine that were judged for both functionality and security. 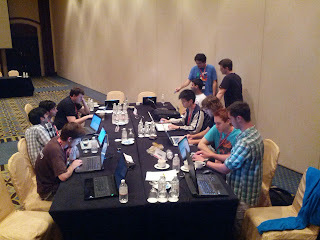 Five teams were then selected to participate in the final round at the SyScan 2013 security conference in Singapore, where they had to do the following: fix security bugs from the preliminary round, collaborate to develop an API standard to allow their applications to interoperate, implement the API, and finally, try to hack each other’s applications. To add to the challenge, many of the students balanced the competition with all of their school commitments. A big congratulations to this very talented group of students! Congratulations to all the people who participated. Where can we see the actual applications developed? hardcode.googlecode.com has a link in "Security Bugs"